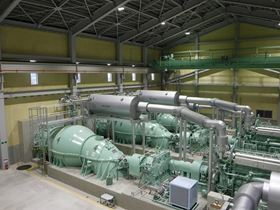 The Ebara drainage pump units at Tsuruga Drainage Pump Station, in Ishinomaki, Japan. Ebara Corp has installed four drainage pump units at the Tsuruga Drainage Pump Station in Ishinomaki’s Nakatsuyama district for Japan’s Ministry of Agriculture, Forestry and Fisheries under a ¥1081.5 million contract. Two of the Ebara horizontal-shaft mixed flow pumps have a diameter of 2000 mm, one has a diameter of 1500 mm, and other pump has a diameter of 900 mm. Located in the northeast of Miyagi prefecture, the Nakatsuyama district is an agricultural area mainly producing rice, but also wheat and soybeans. Flood damage in the area from heavy rain has increased because the area is surrounded by dikes between the Kitakami River and the Kyu Kitakami River, and the discharge capacity is insufficient due to deteriorated drainage facilities. Japan’s Ebara Corp develops a new brand for its standard pump technology. Ebara Corp delivers eight pump trucks for emergency drainage in the Philippines.